Congratulations to Jesmond Dene House Hotel based in Newcastle upon Tyne, Guestline’s latest ‘Wish you were here’ winners! The hotel is made up of 40 luxury bedrooms and suites with each having an individual look and feel and some including an exclusive terrace or garden! The bathrooms in each room have underfloor heating, fluffy robes and slippers and the beds feature luxurious Egyptian cotton for the ultimate night’s sleep – The Jesmond Dene House Hotel oozes luxury and comfort. 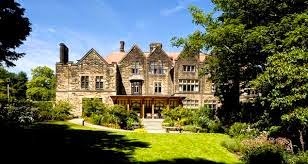 The restaurant at Jesmond Dene is open daily from breakfast to dinner to non-residents as well as guests with locally sourced lunch menus to an indulgent afternoon tea. We especially love the Great Hall, a spectacular, double-height room with oak and silk wall panelling, Gothic windows, carved inglenook fireplace and minstrels' gallery. With a separate, stone arched entrance - away from hotel and restaurant guests - and dedicated lounge bar, up to 100 people can sit down to dinner or around 120 gather for receptions. The Jesmond Dene House Hotel also cater for corporate business clients, with two dedicated meeting rooms on the lower ground floor. They offer free parking, free high speed internet, conference telephones and audio visual facilities to ensure all needs are met. The hotel is a popular choice for weddings, with dedicated wedding coordinators on hand to help with planning. This hotel certainly ticks all of the boxes! Talking about theoretical framework, I can tell you to read online advices. Here you can find high quality tips.